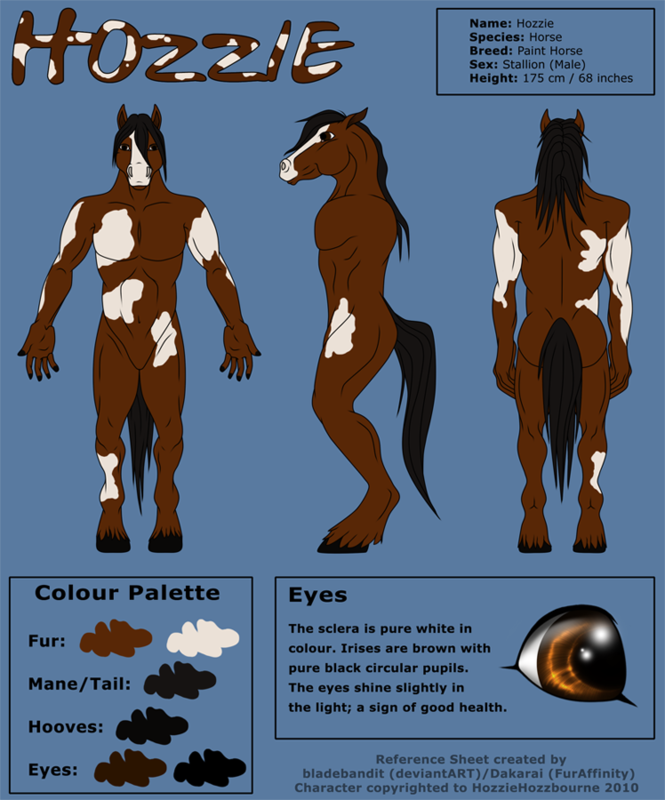 Hozzie is an anthro paint horse stallion with a brown coloured coat with white patches on his arms, chest, belly, hip and on his right ankle. He's also got a white blaize. Hozzie is known to be a calm and nice horse. He is also very cuddly and never says no to cuddling up with a good friend and a good movie. He is very patient and it takes alot to make him lose his temper. Hozzie loves music, especially rock and metal. He also loves to play video- and computer games, much of his time is spent on games, mostly shooters. Hozzie is born and raised in Sweden and he plans to do for the rest of his life. Hozzie is quite muscular but no muscle mountain. He's got anthro hands on his arms and hooves on his legs. Hozzie likes to dress up in a rock/metal kind of way. Dark clothing with various band t-shirts. He always have a chain on his left pocket and he sometimes wears a studded leather wristband. I thought I'd post this Ref Sheet which the awesome artist and my good friend Dakarai did for me.